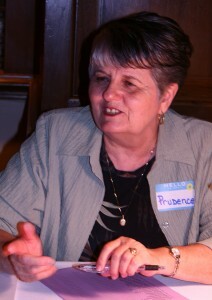 Prudence Dancy, the Founder and General Director of Renewed Living Ministries, has been in ministry for over 45 years. She has worked with various organizations such as Word of Life Ministries, Campus Crusade for Christ, the Intercultural Ministry Training Center and the U.S Center for World Mission. She has served in various pastoral staff ministries including Pastoral Care Director, Women’s Ministries Director and Director of Lay Counseling. She writes training curriculum for leaders on the topic of self-awareness and emotional intelligence, is a certified behavioral consultant and a spiritual director. She loves to teach, counsel and mentor people of all ages, bringing a prophetic voice through God’s Word to this generation. The true desire of her heart is to see others experience God in a more intimate way than ever before. Copyright © 2019 Renewed Living Ministries.